There are reports that Nick Heidfeld has been dropped by Lotus Renault GP for the Belgian Grand Prix – and the suggestion is that he might be out for the rest of the year. His place will be taken by Bruno Senna. The news has yet to be confirmed by the team – and I am waiting to hear from them. The deal makes some sense in the light of the recent announcement that the team’s owner Genii Capital has merged its operations with Brazil’s World Wide Investments (WWI). The WWI company was formed in 2010 by the Sabo family, which owns an auto-parts company in Brazil, which announced that it had $1.28 billion to invest. The initial aim was to invest around half of the money in real estate and the rest in new energy and forestry. The family set up the company with banker Marco Versiani, who previously worked for Itau Unibanco. In July Gerard Lopez and Bruno Senna travelled to Brazil looking for sponsors and in recent days Lopez has been quoted as saying that he had “mixed feelings” about Heidfeld, who was drafted in this year after Robert Kubica was injured in a rallying accident.Lopez said that the team had expected more from Heidfeld. And Senna of course dominated Christian Klien and Chandhok at HRT. What’s ‘the bet Renault try to pull ‘a Senna back in a Lotus’ for their marketing? Conversely Nick might well have expected a better car, then he could have driven it quicker. Makes sense… they got all the development they needed from Heidfeld… now they need money, so bring on those Brazilian sponsors! 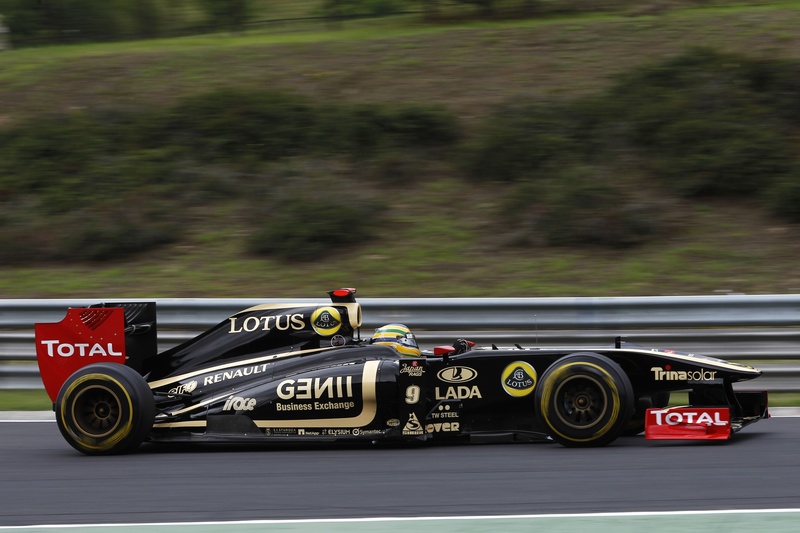 I suspect Dany Bahar of Lotus would prefer it too, simply for the Lotus – Senna name link. But what about Romain Grosjean? He had a seat fitting in the last two weeks so I assumed he would take Heidfelds place. Especially after all the talk about the French governments pressure on Eric Boullier??? Either the new owners are completely clueless or the team is in desperate need of money. he always made the best his machinery allowed him to do. From the awful Prost to a Jordan that past its sell date. No complaints, no whining and unfortunately no winning. Not the exit he deserves and, I hope I am wrong here, more the sign of a failing Renault. The only positive would of this would be to see the Senna name back on the grid. Let´s wait for the confirmation. I´m anxious to see what Bruno can really do once his season racing for Hispania could not tell much. I´m Brazilian and hope he succeedes, but I´m not so sure about his talents and that already makes me nervous. “Quick” Nick has never lit my world on fire, and I would love to see Bruno Senna in a more competitive car. Bring it on, I say. I’d say something like “wow, a team replacing a driver with a designated test driver” but Renault have so many it would have been harder to choose someone not one of their test drivers. Glad you’re back Joe; looking very refreshed in the new photo., too. Shame for Nick; first reports I read ‘what the…Senna mania’, but thanks you’ve pointed out a very valid connection. Great photo, Joe. Looks like you’ve lost a lot of weight but that’s not so bad since you look more aeroynamically poised for the rest of the F1 season 🙂 Hope you had a refreshing break! Every week that goes by I dislike that Genni Capital F1 Racing Team more and more. The spite that’s been spat at Heidfeld in the past few races by Boullier is wrong. You will find few drivers who could have come in a done a job like Heidfeld has this year – and any they put in the car now will not do better. OK, so he doesn’t have tat last vital 1% to be a great, but he’s a damn good driver. And a ‘top’ team now with two pay drivers. Foeful. Heidfeld’s done a steady job, as Heidfeld has always done a steady job. He doesn’t pull up trees but he does a job and he’s done that job. But as the BBC point out, he’s on a salary and Senna isn’t. It’s a shame to see so many once-great teams having to resort to pay drivers, but I suppose we are where we are. I always get worried when teams start messing about with the drivers lineups mid season, it smacks of fiddling while Rome burns. Heidfeld is a solid enough driver but little more than a journeyman, really, never going to set the world on fire but likely to do a decent enough job. The choice of Senna, though, tells more about the money side than anything else, he was profoundly unspectacular (OK it was hardly a great car but any driver of brilliance can wring something special out of a rubbish car). While I agree that Boullier has been wrong with what he’s been saying recently, I don’t agree that only a few drivers can do what Heidfeld has done. Of course (back to agreeing with you again), as has been seen many times, it’s rare that someone can step in at this stage and be faster than a competent driver who’s been in the car the rest of the year. Senna’s appointment may well be commercially motivated but the fact is, Heidfeld hasn’t really performed either. For all his development skills the team had gone backwards following a promising start (although budgets will have influenced this) and he’s been generally overshadowed by the not previously highly rated Petrov. For Heidfeld, it looks like his F1 career is over. I too think Grosjean will be in the car once the GP2 title is wrapped up but for now I’d like to see what Bruno can do in a reasonably competitive car. He was never the pace setter in F3 or GP2 but he was capable of winning races, so let’s see. another ‘business’ decision, having any new driver in the car will only put more pressure on Petrov .. will senna score more points than heidfeld could? Doubt it, not that he hasn’t got talent but without testing he’ll take most of the season to get used to the car. Lopez is beginning to remind me more and more of Flav. I’d have liked Nick to be doing better too, but considering his car’s burst into flames in the last two grand prix, maybe it’s not all his fault. He’s beaten Petrov 5:2 in the 7 races in which both have finished and he’s scored more points than him. I guess money talks, maybe Renault/Lotus/Whatever don’t want another burnt out shell in Spa. What a load of cobblers, has Heidfeld out performed the far less experienced Petrov? No. Nick is average as usual. No point having a 10 season average driver in the car when you could have a star waiting in the wings that needs track time to prove one way or the other. The Heidfeld “love” is ridiculous. He wasn’t bad and that’s as far as your praise can go. It would have been interesting to see what Kubica would have done in this car. Heidfeld needs to make way for the young blood who could make a real impact. Good news i think, do you rate Bruno, Joe? He seemed to go well in GP2, seems a very likeable chap too. You know, I’m sort of starting to come round — half-way round, anyway — on this whole “pay-driver” thing. Petrov, Maldonado and Perez all have their seats because of the backing they bring, but none of them have disgraced themselves at all. Far from it, I would say — Maldonado and Petrov have both had their brain-fades, but both seem to be showing good speed. And Perez is very good at what he does. Would we agree that it is to drive a car quickly while consuming a minimum of consumables? I would love to see the data on Perez’s fuel use. Anyway, just because a driver arrives accompanied by four burly gentlemen with suitcases full of cash doesn’t necessarily seem to mean he’ll be rubbish. BRICs rule, hence Vitaly and Bruno until at least 2016. Is the revolving door of the engineering department finally coming to roost? Shame to see a once successful team imploding. A bit like Williams really. Isn’t it strange to replace a driver who has currently more points than his team mate because he is “underperforming”? Petrov may do a decent job in qualifying this year, but Heidfeld is a better racer and it’s in the race that you can score the points. He surely did a couple of great races this year. Maybe not enough to shine, but then again, Petrov only impressed in the very first race and that’s six months ago. Heidfield needs replacing, but Senna? Really? How about riccardo to replace him. Remember Kubica said at the time that out of Heidfeld, Senna and Liuzzi that he thought Liuzzi was the best one to replace him while he recovered from his injuries. Do you think he may have been correct. The team will not have much experience now to drive the development of the car forward and as a result may slip further behind. On a side note regarding all the comments about Joe’s new image. Perhaps he has come into some money and he has bought himself a Renault drive for later on in the season? on August 25, 2011 at 10:31 am | Reply Nicko! Hmmm… Renault set to trade a driver who hasn’t won anything in the present century for a driver who hasn’t won very much at all. Still, one less beard about the place I suppose.